Does Your Steering Wheel Shake While Driving? Steering wheel shaking while driving is not only annoying but it can also be dangerous. It's usually a symptom of something amiss with your car's front wheels, suspension or bakes. So it's important to figure out what's causing the shaking and get it sorted before it leads to an accident or worse. What can you do if your car steering wheel is shaking? First off, if you aren't mechanically minded then get your car checked out by a qualified mechanic. For those of you trying to diagnose the problem yourself, here's the top five causes of steering wheel shake. All wheels and tires are slightly imperfect, even when brand new. Most of the time the imperfection is not visible to the naked eye, but exists as what's called an asymmetry of mass. If left unchecked, this asymmetry will cause horizontal or vertical vibrations as the wheel picks up speed. To compensate for this, small weights are fixed to the inside or outside of the wheel when a new tire is fitted. This evens out the imbalance and removes most of the vibrations. Over time, as tires wear, the imbalance can return. Tires don't always wear evenly, for a number of different reasons and this can make the weights less effective. Sometimes, one or more of the weights can fall off the wheel, causing it to vibrate when it turns. This vibration then travels up through the steering column, causing the steering wheel to shake. An unbalanced tire can also cause the steering wheel to shake at high speeds on the highway as the vibrations are passed through the suspension and causes it to resonate. You may find the shaking is only there at set speeds and goes away when you slow down. Worn or seized brake components on the front of a vehicle can cause steering wheel shake. The most common symptom of worn brake components is a shaky steering wheel when braking. This is usually caused by worn rotors that are no longer smooth. It can also be caused by brake pads that are nearly worn out or that have worn unevenly. When you press the brake pedal, the action of the brake pad squeezing against the rotor causes a vibration that is passed up through the steering wheel. You will also feel a vibration in the brake pedal as you slow down. One other way the brakes can cause vibrations is through a sticky brake caliper. When you press and let up the brake pedal, the caliper should squeeze and release the rotors. Over time, the caliper can start to rust and get gunked up with brake pad dust, causing it to seize intermittently. A tell tale sign of a seized caliper is a burning smell coming from the rotors. 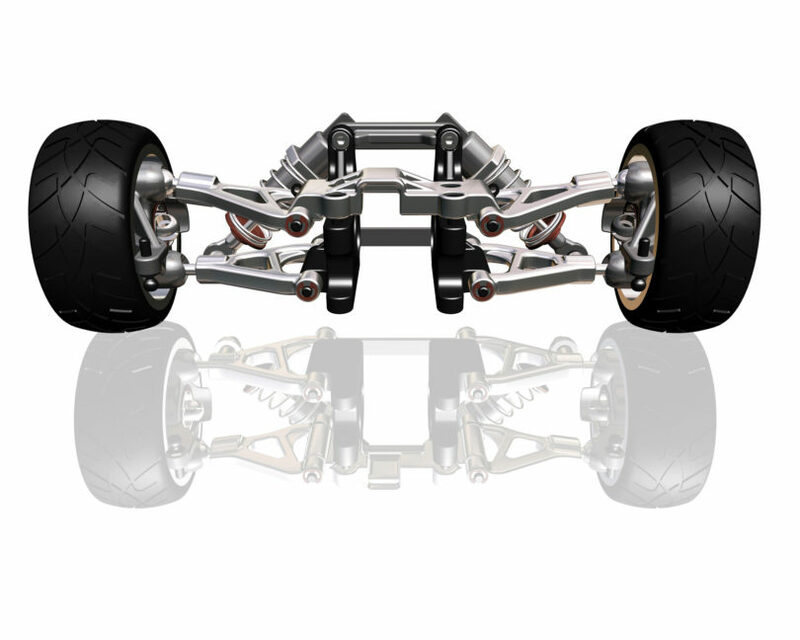 The front suspension of most vehicles is made up of many different interconnected parts. At the connection points are rubber bushings that allow the parts to move independently of each other. Over time, if left unchecked, these bushings can become worn causing the joints to loosen and vibrate when the car is moving. There are lots of different symptoms that can arise from worn suspension parts, depending on where they are and what their job is. Most worn parts not only vibrate, but will also affect how the car handles, and will usually be accompanied by clunking noises when you go over a pot hole or speed bump. Worn shocks can also cause steering wheel vibration if they can no longer absorb the bumps on the road. Even if a shock is not visibly leaking fluid, it can still be defective and need replacing. In a new car with new tires and suspension parts, everything should line up perfectly without any vibrations. Wheel alignment can be complicated to understand, but basically refers to the adjustment of the wheels relative to each other and to the suspension. All cars come with manufacturer specifications when it comes to wheel alignment and it's something that should be carried out regularly to ensure even tire and suspension wear. Wheels can become misaligned over time through wear and tear or by hitting pot holes, kerbs or speed bumps. Misaligned wheels can cause a vehicle to behave unpredictably and cause tires to wear unevenly, causing vibrations in the steering wheel. The front wheel bearings are often overlooked as a source of wheel vibrations. As they age, they can become loose and can cause the hub to become unbalanced as it rotates. A defective wheel bearing will usually make a noise that sounds like metal rubbing against metal. This grinding or grating noise, will be most noticeable around the wheels. It can be difficult to isolate when the vehicle is moving, and can sometimes sound like it's coming from the engine. If you jack up the front of the vehicle and rotate the wheel, it will almost certainly make a noise if the bearing is bad. There will also be a fair amount of movement in the wheel if you grip the top and bottom of the tyre (at 12 and 6 o'clock) and try to shake it. First and foremost, if you're not a competent mechanic or know what you are doing it's best to leave diagnosis to a pro. Most reasons for steering wheel shake are going to be caused by worn or defective parts that are vital for safe driving. In saying that, here are a few things you can do to isolate the problem before you hand it over to a mechanic or start swapping out parts yourself. It's fairly easy to check the bushings and shocks on a passenger vehicle. Check Struts -Start by pushing down on the front wing of the car to see how stiff it is. If it bounces up and down quickly, or there are any strange creaking noises, then you're shocks are probably worn and may need replacing. Check Springs & Strut Leaks - You can also check to see if the shocks/struts are leaking by shining a torch in over the top of both front wheels. You should be able to see the spring and top part of the shock. It should be clean, dry and polished looking. If it's wet or oily, then you'll need to investigate further. Check Rubber Bushings - To check the bushings, jack up the front of the car (check the manual first for safe jacking points) and I'd advise resting it on a suitable jack stand. Now grip the wheel at the top and bottom and try to push and pull on it. If there is a lot of movement this could point to worn bushings on the control arms or wishbones. Visually inspect suspension components - If you suspect one or more of the suspension parts is worn, start by visually checking each one for wear. Worn rubber bushings can easily be spotted, and in many cases the suspension part itself may feel looser than it should. I top tip is to use a large crow bar (or pry bar) to see if there is any movement in each of the suspension parts. Jack up the front of the car again and remove the front wheels to expose the brake discs/rotors and calipers. 1. Check the brake rotors/discs - Visually inspect the rotors for bumps or heavy pitting on the surface. It's normal to have a small lip on the edge of the rotor as it wears, but an excessive lip may rub against the edge of the brake pads causing a vibration. Use a torch to check the back of the rotor for excessive wear or rust. Try rotating the rotor by hand, and feel for resistance or lack of smoothness. If you have one, you can check the runout of the rotor using a brake rotor gauge and micrometer. This may show up defects that are difficult to see. 2. Check the brake pads - Using a torch check the exposed surface of the brake pad for wear. Make sure the pads are not worn down to the metal backing plate, and that there is enough pad left to meet minimum safety requirements. You can also check that the pads are wearing evenly and not at an angle to the surface of the disc, as this can also cause a vibration on braking. 3. Check the brake caliper - Check the overall condition of the brake caliper and ensure it's clean and rust free. Get a friend to pump and release the brake pedal while you try to rotate the rotor. If the caliper is sticking and not releasing properly it will be more difficult to turn the rotor by hand. Further investigation may then be necessary, but this involves removing and disassembling the caliper. It's fairly easy to check if the wheel alignment is off. 1. Check the tyres - Inspect the tyre threads for uneven wear. If they are more worn on the inside or outside this can be caused by a bad alignment of the wheels. 2. Check the car runs in a straight line - If the car has a tendency to pull to the left or the right when driving in a straight line this can also be caused by a bad alignment. To get the wheel alignment set up properly you will need an alignment tool, and this is best left to the pros. A laser alignment tool is the only way to get the wheels set up exactly to manufacturer specs. It's not possible to check if the wheels are properly balanced by just looking at them. You'll need to have them checked professionally using a wheel balancing machine. If they are out of balance, this can usually be remedied fairly easily and doesn't cost too much.